This book has been on my shopping list for a while. It's only until there was a major discount at a local bookstore that I decided to buy it. Don't be like me. If you're into comic books, buy it now. This is a comic book based on the lost screenplay of Jim Henson and writing partner Jerry Juhl. Tale of Sand is a fascinating tale of imagination. The story starts out with a man at a desert town. Without much explanation, he was told to cross a line somewhere in the desert. That's when we start to follow him to the end point and along the way see unexplainable things and events. In the middle of the desert, there's a man running with a huge ice cube that melts until it's small enough to be dropped into the wine glass of a lady sitting by a swimming pool with a shark in it. Then the scene cuts to another unbelievable one. That's the kind of experience you'll be getting throughout. The storytelling style reminds me instantly of the Japanese animated film Paprika. Everything is unexpected and the imagery changes constantly as the story flows along. The art from Ramon Perez is mesmerizing. The paneling and layout are fantastic. The drawings are great and the colour palette is used appropriately to create the psychedelic mood of the story. This is a screenplay that's wonderfully realized in comic form. Actually, I can't see how it can be shot as a live action when Jim Henson wrote it. Highly recommended if you want to read a comic book that's quite different. It's an enjoyable read. I also recently picked this up and agree that it's a great comic book. 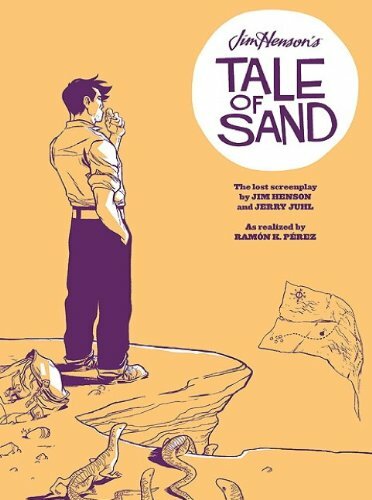 Going through Ramon Perez's art on his official website, I was on the fence, but his work on Tale of Sand is excellent. I too wrote a little review on my blog (https://bit.ly/Lp4siG) as I wanted to give it some exposure in my own little way. Thanks for highlighting this book for me Parka, keep up the good work man.